Lawns are notoriously high maintenance. Taking care of plants, herbs, vegetables or flowers involves knowledge, time and care. Patios or decking can sometimes be expensive and not all gardens are big enough to warrant these installations anyway. Water features, on the other hand, come in all shapes, sizes and prices and they are extremely low maintenance. In fact, you don’t even need an outdoor space to enjoy the benefits of a water feature. For those people who don’t have a garden or even a small balcony to work with, there’s always the option of installing a beautiful wall fountain for one of your indoor spaces. While you might not be able to reap all the advantages mentioned in this post with an indoor wall fountain, you will still benefit from adding value to your property and from the serene feeling that running water creates. If your outdoor space is looking a little drab or boring, a water feature can instantly add interest. As water is a fluid material, your outdoor space will benefit from the addition of a new texture. 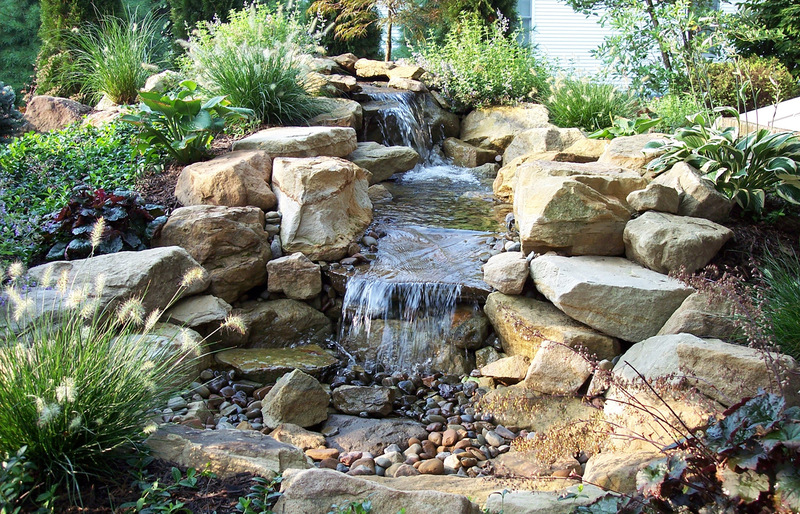 You will have fun choosing the kind of water feature best suited to your space. Perhaps you’ll feel inspired to invest in a pond or a small freestanding fountain. You might choose something in bronze, stone or marble. Ponds are suitable for the cultivation of aquatic plants and for housing fish. Fountains, which trickle water day and night, will glisten in the sunlight. The options are endless and the effects are instantaneous. Water features will also encourage nearby wildlife to settle in your garden. Birds love bathing themselves in trickling water, while frogs enjoy living next to it and insects tend to feed on it. Even city dwellers will begin to see more local wildlife after having installed a water feature. It is believed that encouraging wildlife to settle in your garden will have a positive influence on the emotional development of children in your household. Water is an element with reflective properties. This means that it has the potential to make any space appear bigger than it actually is. This is one of the reasons why a water feature can be a really good idea for those of us who have small outdoor spaces to play with. Any kind of water feature with underwater lighting will especially help to make your space seem larger at night. Some water features come equipped with economy lights that charge automatically by drawing on solar power from the sun during the day, which saves on electrical costs. You’ll also be surprised at the range of colours and designs available. There’s bound to be something to suit your taste. Even if you’re quite happy in your home at present, there may come a time when you want to move on. As a homeowner, even the smallest of water features can add some degree of value to your property. This is one of the reasons why you should still invest in a water feature, even if you don’t have an outdoor space to decorate. The sound of water is one of the most relaxing sounds on the planet. It has the ability to transport us to a lakeside landscape in the mountains, or to the rolling waves of the sea at a beach resort. It can dampen out the sounds of noisy neighbourhood traffic and help you to find your inner zen amidst capital city mayhem. If you need help relaxing of an evening, try investing in the soothing powers of a water feature with a running water system and increase the serene-like surroundings of your home by decorating your water feature with flower petals.